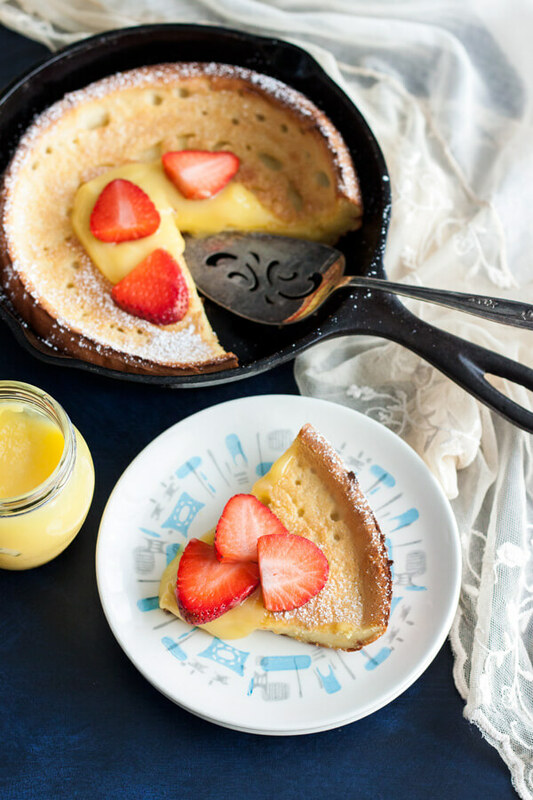 This Lemon Dutch Baby for two is a small batch recipe that’s perfect for you and your sweetheart to enjoy on a slow weekend morning. Served with homemade lemon curd and fresh berries, it is sweet, tart, and refreshing. I have an insatiable love for any kind of sweet breakfast, like French toasts and pancakes. So this Lemon Dutch Baby is no exception. And to be completely honest, I made it so I can serve it with this homemade lemon curd from earlier this week. They truly are a perfect pair. 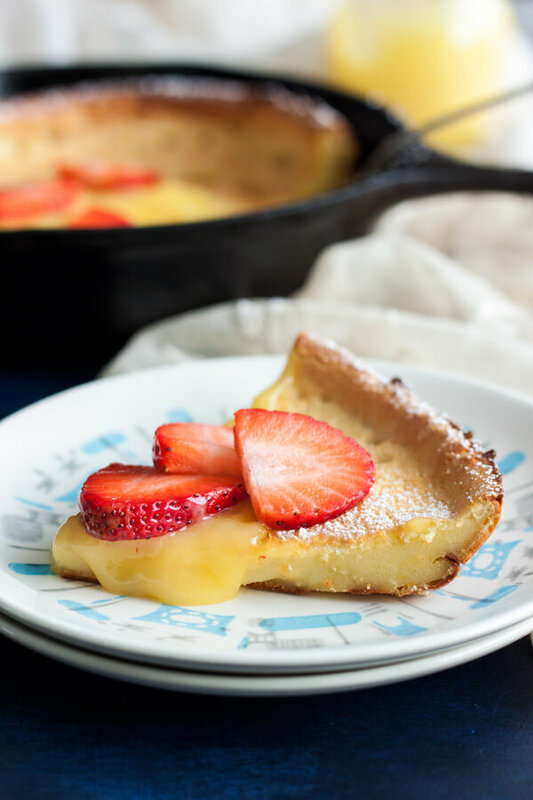 What’s even better about this dutch baby is how easy it is to make, a completely fail proof delicious breakfast every single time. 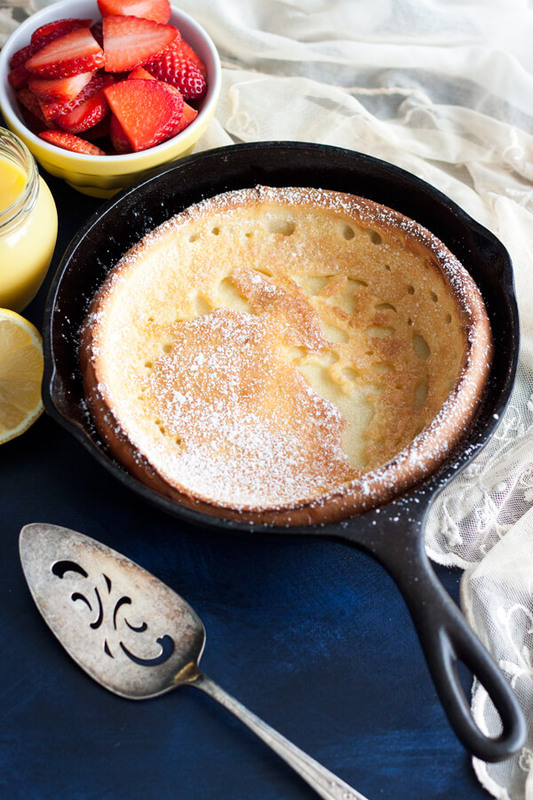 A blender or a food processor makes blending up the batter for this Lemon Dutch Baby a breeze. Always add citrus zest directly to the sugar, mix it well with a whisk or rub with your fingers to release the essential oil. This step is my favorite since it’s like getting aromatherapy. Preheat your cast iron skillet or another oven proof skillet to ensure even heating. I like my dutch baby on the thicker side, so I use an 8” skillet. You can use something a bit larger to get thinner dutch baby, 9” to 10” at the max. 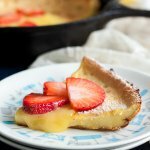 While you’re waiting for this lemon dutch baby to cook in the oven, you can prepare all the other sides to serve for brunch. Cut up your strawberries, get your lemon curd ready, and if you want, you can make some homemade whipped cream as well. But of course, both store-bought lemon curd and whipped cream will do in a pinch. And don’t forget the protein and the coffee. 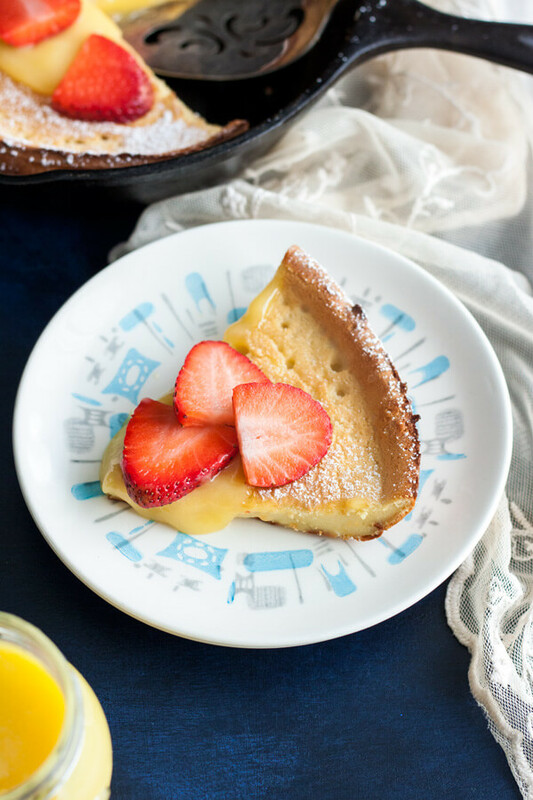 This simple yet delicious Lemon Dutch Baby is the perfect treat to indulge on the weekend, whether or not it’s for a special occasion. 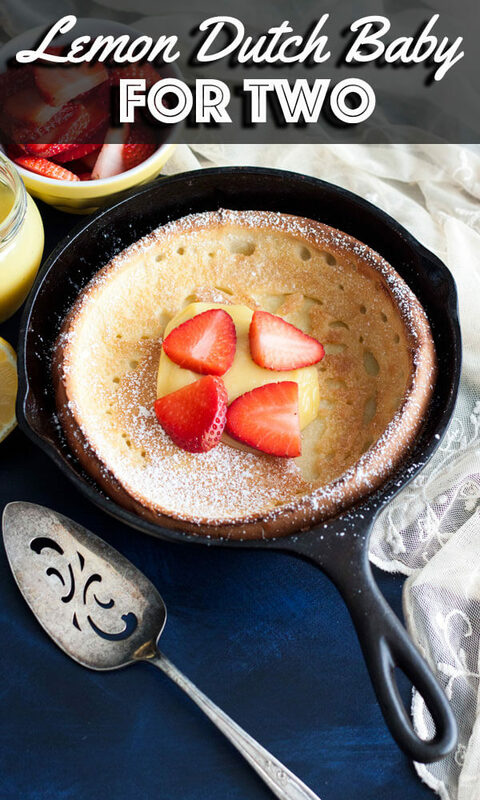 But sitting down and having a meal with your loved one should always be a special occasion, so enjoy every moment of it with some delicious dutch baby no less. Preheat the oven to 425°F along with the cast iron pan. Melt half of the butter in the microwave for 30 seconds. Add sugar and lemon zest to a small mixing bowl and mix together with a whisk or rub with your fingers to release the lemon oil. In the same bowl, add flour and salt and mix together thoroughly with a whisk. 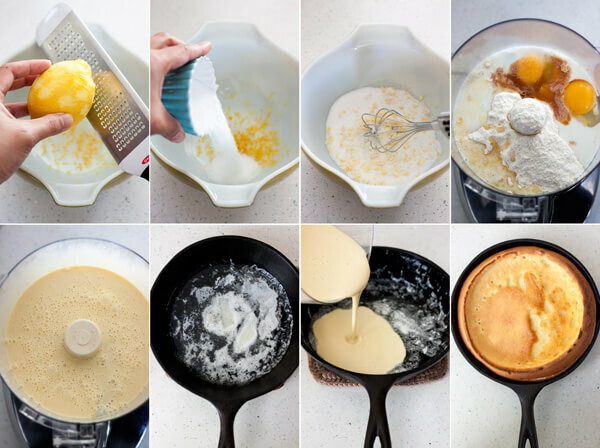 Transfer the flour mixture to a food processor, and add eggs, milk, vanilla and the melted butter. Process until everything is thoroughly combined, about 30 seconds to 1 minute. Add the rest of the butter to the hot cast iron pan, swirl around to coat the bottom and the side completely. When all the butter has melted, add the batter to the pan and put it back into the oven. Bake for 20 minutes without opening the oven door to allow the dutch baby to completely puff up. 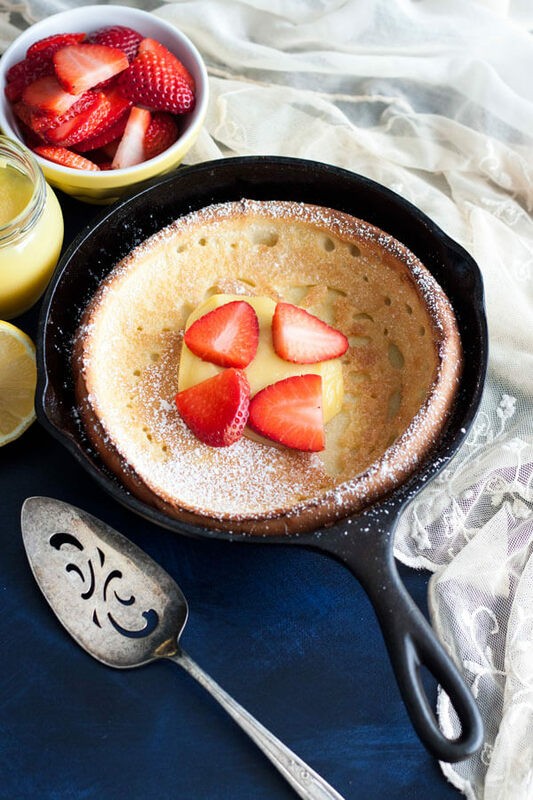 Serve with fresh berries, lemon curd and powder sugar. 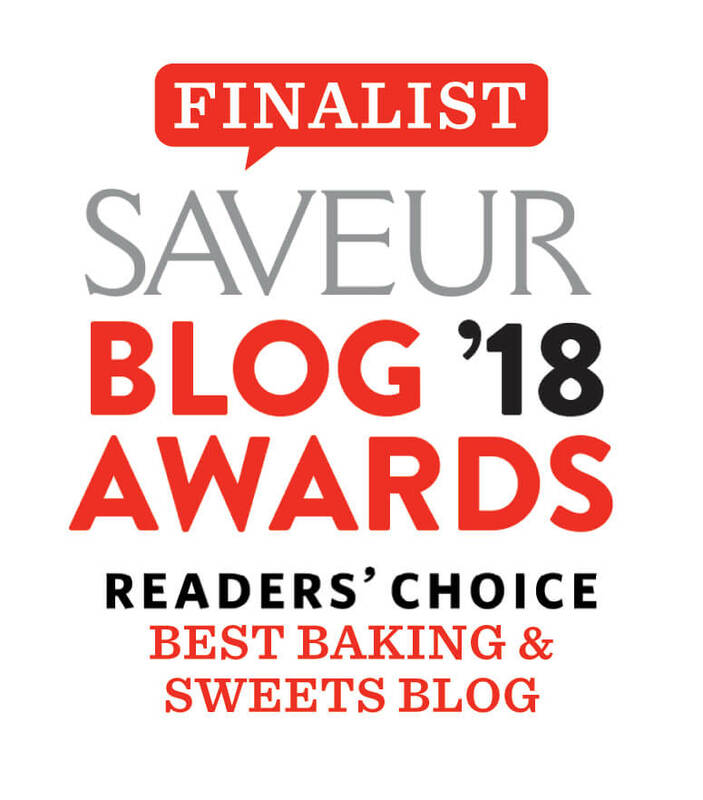 Delicious and easy to replicate, thank you! Excellent, thanks for the feedback Linda!